Who gets to do burnouts in the middle of Manhattan? Who gets to stand on full ABS stops on empty side streets? Who gets to do all this and more without anyone noticing? The Toyota Avalon driver. Avalons have become the standard choice for hire car operators in the city. They’ve almost completely wiped out the departed Crown Victorias’ luxury brother, the Lincoln Town Car. A black Avalon with a ‘Dial 666 Car Service’ sticker on the back is a part of the Manhattan landscape now. Ubiquity breeds anonymity, and you can use that to your complete advantage. If you floor the Avalon with the traction control off, you will reliably spin the tires just as the engine passes 3,000 RPM, and you will continue to spin them until the tach needle passes the four. Hold the gas and the brake together while waiting for a stoplight and the car will happily lay rubber for a good four car lengths. As a test of the car’s suspension, I decided to let the thing rip at full tilt down possibly Manhattan’s worst cobblestone street, Bond Street. The roadway heaves like the North Sea. The tires squealed in and out, gaining and losing traction as the shocks thumped and bumped away. Why not? Nobody even turned their head on the street to look, and my boss (riding in the back seat, reading emails on his phone) didn’t even notice anything was going on. I know this because you can get away with absolutely anything behind the wheel of what every other human being in Manhattan believes is a cab. People expect nothing less than complete hooliganism. For reasons beyond my understanding, a hire car-grade Toyota Avalon courtesy of Toyota showed up at the Jalopnik office the other day. Normally we’re an enthusiast-minded site, but I guess we needed the car for a video shoot and my boss is too lazy to buy a car for himself. What my boss didn’t know is that I’ve had a secret affinity for the Avalon ever since this generation came out. 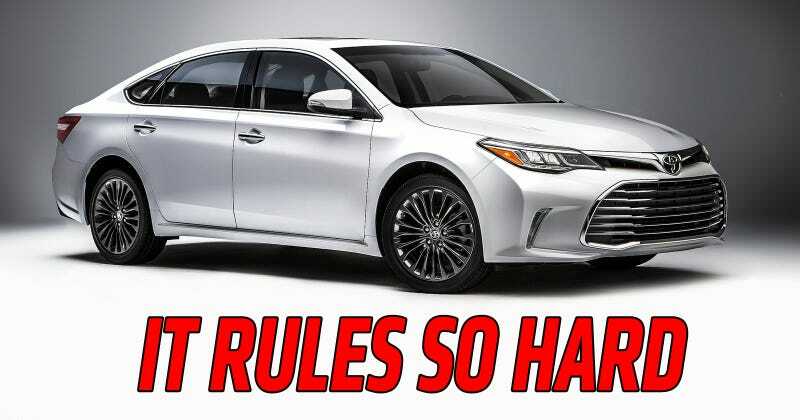 I tend to lust after sports cars designed when Musollini was running Italy, or microcars designed to fit inside a suitcase, but I can’t deny my Avalon feelings. It’s a neatly styled car, particularly handsome navy blue with a white leather interior. You’d be insane to buy an Avalon with a never-wear-jeans white leather interior, but it looks fantastic, as good as it does in any Range Rover. Toyota is as plain a car brand can be, and its cars are almost completely stripped of pretension, but this Avalon verges on elegant. The seat heater knobs, for instance, are done in a clean metal finish, with a nice bit of weight to them, and they click to hide away when you’re not adjusting them. Bentley does the same with their controls. There’s a huge trunk, lots of leg room, firm but comfortable seats, a slightly stiff but controlled ride, a great center stack, a wide flat floor, and surprisingly communicative pedals. It’s a straightforward vehicle, well-executed for everyday use. But there’s something great about this Avalon, and other big front-drive sedans like it. I figured this out when I took an old Lexus ES300 to a rallycross — these things are hilariously fun when you stop driving like their usual octogenarian owners and start driving like a maniac. It feels illicit. It feels like you’re getting away with something. It feels good. When it’s all over and you stop driving like you’re trying to get yourself arrested, the best part is that the car returns to its calm, usual self. It becomes just another car on the road, only a little bit roomier, a little bit nicer, and absolutely invisible. So if you want a car to shred, to hoon, to absolutely thrash under the radar, get yourself an Avalon.